Fine Art from my collection. 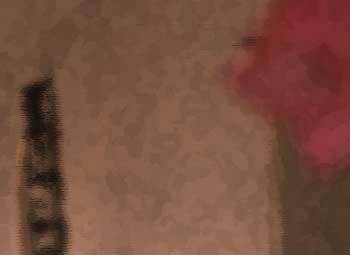 Some items are available for sale. This is a new section. More art, paintings, ceramics, and photo-art will be added soon. Kenneth Larson is a designer and artist native to and living in the Los Angeles area. He has been involved in designing and building scenery for the motion picture industry for over a quarter century. Kenneth has recently started to make some of his art available to the public and to Interior Designers. Kenneth is an accomplished amateur photographer and computer graphics enthusiast. 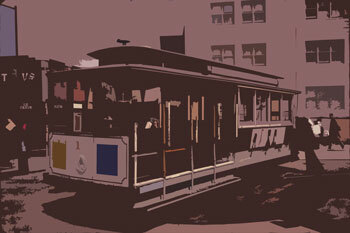 He combines these talents in producing both abstract and realistic images which Ken calls "Photo-Art." Most of Kenneth's photography is close to his home. He has always been interested in architecture, particularly old architecture. He is currently engaged in a pilgrimage to visit all 21 Mission in California and then will begin visiting other missions in the US Southwest. 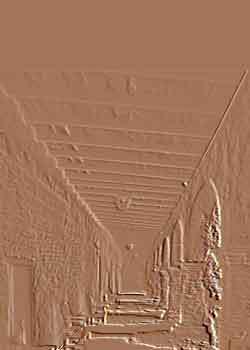 This has given rise to his "Mission Series" of digitally stylized mission photographs. When painting, Kenneth tends toward abstract art, sometimes with a sense of humor. This is especially true of his ceramics where he likes to overwork the clay until the "right amount" of distortion results. 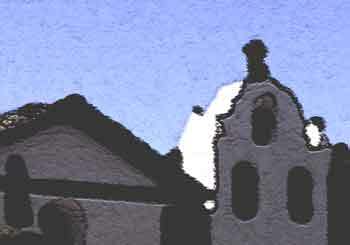 Mission Carmel, Digitally stylized - enlarged section. 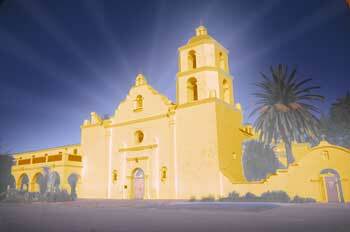 Mission San Diego, Digitally stylized. 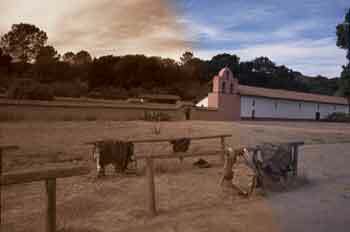 Mission San Diego, Digitally styalized - enlarged section. 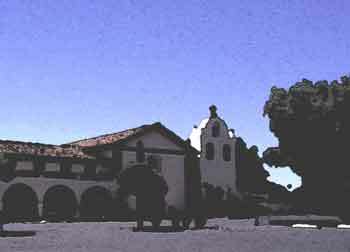 Mission San Louis Rey - "King of the Missions", Digitally stylized. 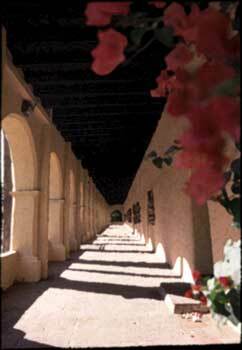 Mission San Fernando, Digitally styalized. 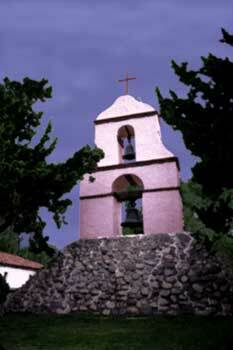 Mission San Fernando, Digitally styalized - enlarged section. 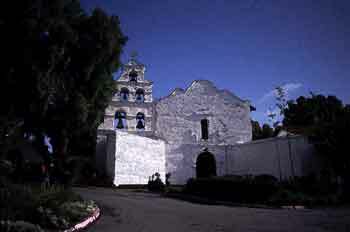 Mission San Gabriel, Digitally stylized. 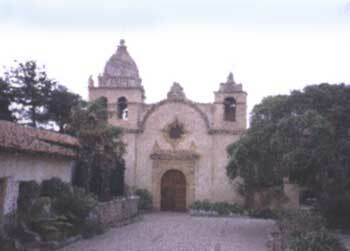 Mission San Gabriel, sepia tone. 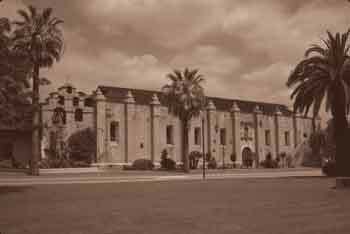 Mission La Purisima Concepcion, sepia tone blend to color. 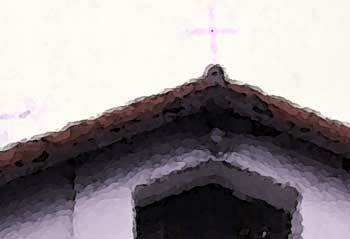 Mission Santa Barbara, Digitally stylized. 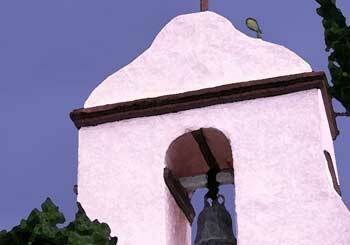 San Juan Capistrano, Digitally stylized. 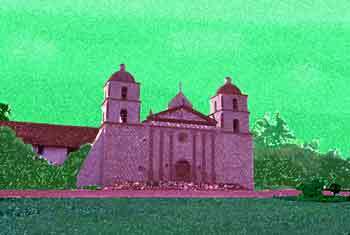 Mission Santa Ines, Digitally stylized. 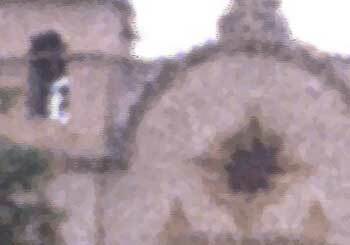 Mission Santa Ines, Digitally stylized - enlarged section. 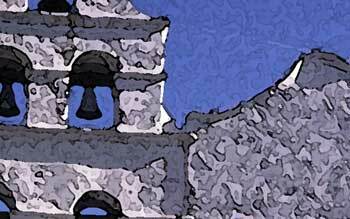 Mission San Antonio de Pala Asistencia , Digitally stylized. 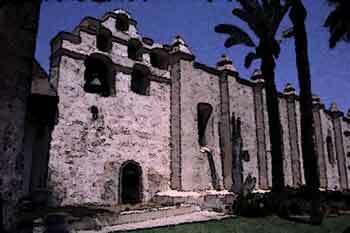 Mission San Antonio de Pala Asistencia , Digitally stylized - enlarged section. 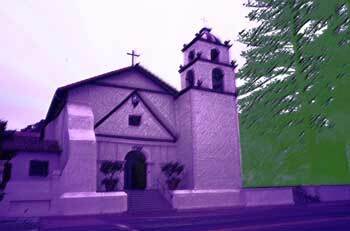 Santa Ysabel Asistencia, Digitally stylized. 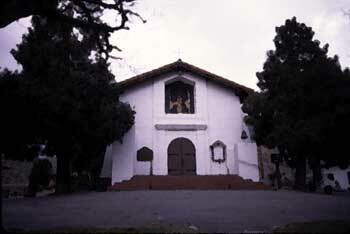 Santa Ysabel Asistencia , Digitally stylized - enlarged section. 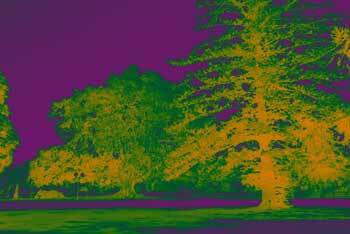 I can produce similar effects to other missions in the Gallery upon request. 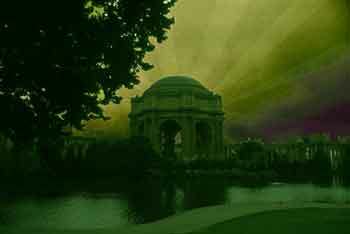 Palace of Fine Art, Digitally stylized. 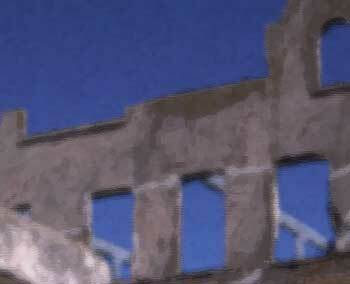 Alcatraz Prison, Warden's House. Digitally stylized. 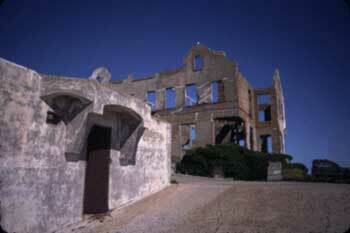 Alcatraz Prison, Warden's House. Digitally stylized - enlarged section. 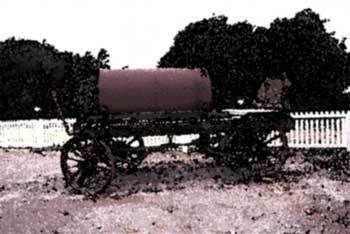 Olivas Adobe Historical Park, water wagon. Digitally stylized. 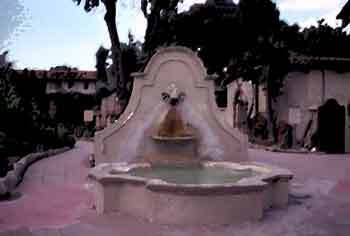 Camarillo Rancho Museum. Digitally stylized. 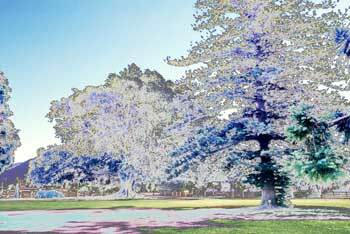 These images can be printed on canvas or glossy ink jet photo paper using UV archival ink. Ink is rated for one year in direct sun and almost indefinitely if away from direct sun. They can also be printed on traditinal photo paper.  Printed to custom sizes up to 60 inches wide. Framed at an additional cost. Contact for quotes.
. 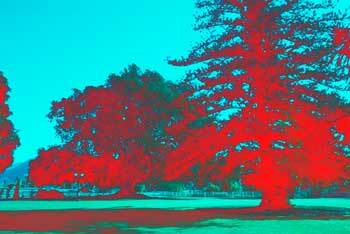 Example of Pricing Photo Art . . These prices are estimates and subject to change. E-mail for exact price. All rights reserved. Ken is developing a line of hand made individual ceramic miniatures. Watch for them in the spring of 2005. These are individually hand made using simple tools. Each one is unique. 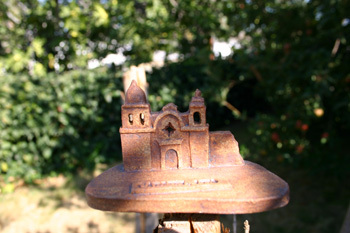 These ceramic miniatures are made by a native Californian within five miles of a mission. No molds or casting are involved. Each is signed and numbered. Three sizes will ultimately be offered. The small are 2 inches high except for some long missions which are lower. Medium will be twice the size of the small. Large will tend to vary. We are considering a cost of $150.00 for the small including tax and shiping in the US. We may later offer an oak display shelf. Copyright © 2003, 2004, Kenneth A. Larson. All Rights Reserved.